Army Lt. Col. Tandy Brown, center, commander of the 7th Special Forces Group, serves a soldier and his daughters during a Thanksgiving Day meal on Eglin Air Force Base, Fla., Nov. 24, 2014. Many families celebrate Thanksgiving with their extended families. Airports and highways are so crowded that a video of Thanksgiving traffic on a Los Angeles freeway makes an iconic picture of the trek to go home. The song Over the River and Through the Woods vies for top Thanksgiving honors with We Gather Together. Where do you go, though, when you’ve only been “home” for a few months, or for a couple of years at most? Whose food reminds you of Thanksgiving when Grandma is across an ocean? Where do you make memories if all your dishes are still in transit, wrapped in packing paper, and (the gods willing) unbroken? 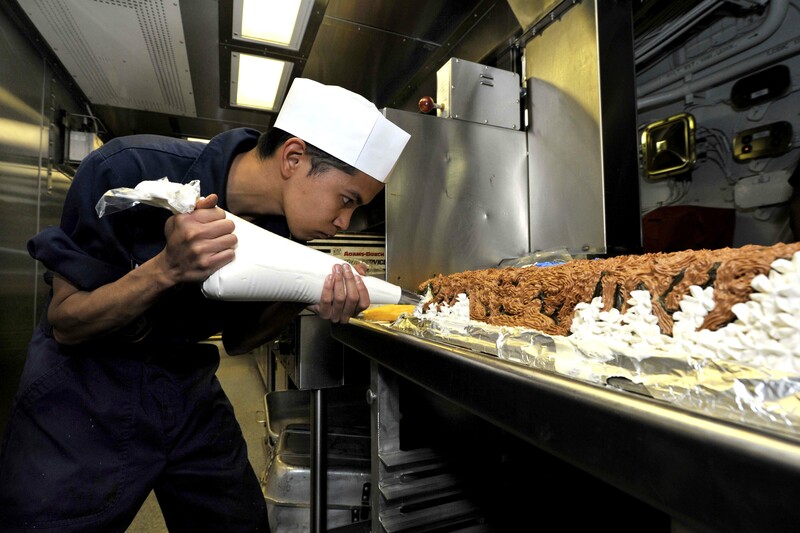 If your family is a military family, you may go to the dining facility (DFAC), formerly known as the chow hall, mess hall, or mess deck. What you call where you eat depends on the service to which you (or more likely, your parent) belong. 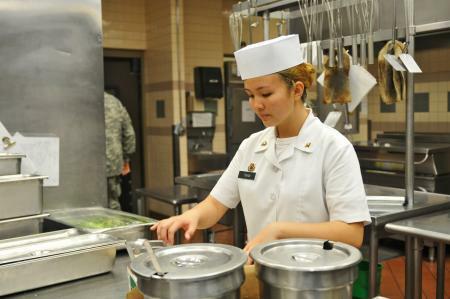 Usually, dining facilities are reserved for service members on active duty. Their primary purpose is to feed the Army that, in the words of Napoleon Bonaparte (or Frederick the Great, depending on your source), marches on its stomach. 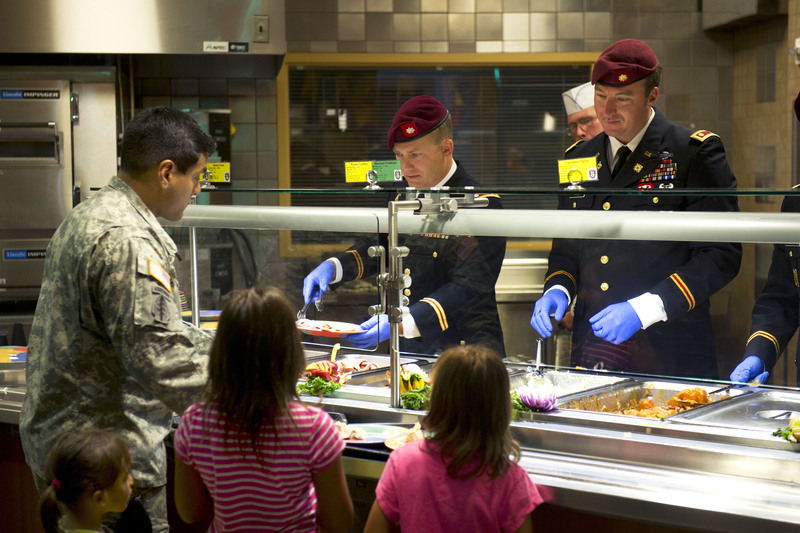 On Thanksgiving (and sometimes on Christmas), the dining facility is open to family members. This is a treat that many military Brats look forward to when they are children, and reminisce about when they are grown. My sister and I recently rhapsodized about the shrimp cocktails we remember setting on our trays as we moved through the dining facility line. In Facebook groups for Brats, the talk in this week leading up to Thanksgiving has been about eating at the dining facility. Among the comments were those about tables full of fruit and candy, how the cooks decorated the dining facility even up to ice sculptures, and food that included roast turkey or ham, mashed potatoes and pumpkin pie, in addition to fancy food such as that delicious shrimp cocktail, crab legs, and prime rib. My own favorite memory (in addition to the shrimp) was going to the milk dispenser and lifting the heavy weighted handle so that the milk shot into my glass with enough force to produce bubbles. I must say that, as a basic trainee pulling KP in the mess hall, I wasn’t quite as thrilled to heft the five gallon cartons of milk into the dispenser cabinet — those suckers weigh over 40 pounds. Army Spc. 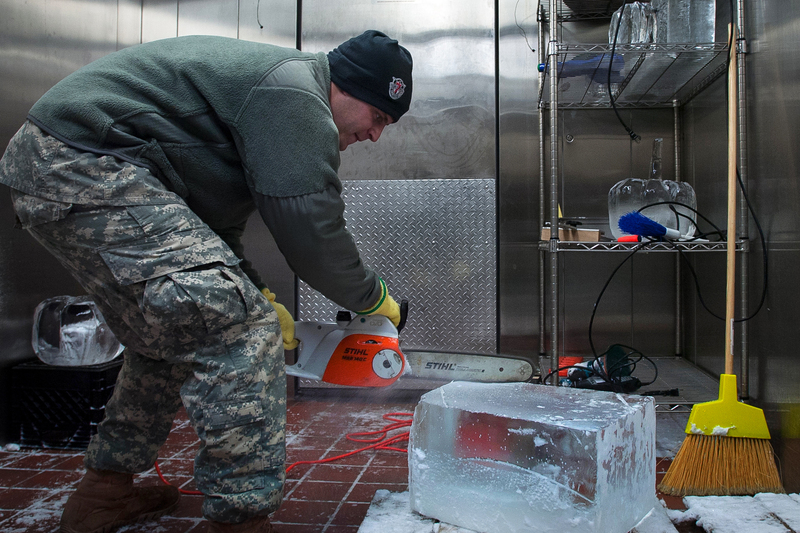 Matt Squairs shears off a corner from a block of ice he is sculpting into a pumpkin on Eglin Air Force Base, Fla., Nov. 21, 2014. Squairs, a culinary specialist assigned to the 7th Special Forces Group Airborne’s Group Support Battalion, and other cooks spent more than two weeks preparing a Thanksgiving meal held in the unit’s dining facility. We Brats doted on being allowed into the dining facilities for holidays, but I don’t know that we fully appreciated the work that went into feeding people their daily three square meals, seven days a week, plus holidays — way more people (and food) on the holidays. As someone who has seen both sides of the serving line, I’d like to give all the cooks a rousing cheer, despite the cadence songs we sang about the food. After a day of KP, I felt as if I’d been pulled backwards through a keyhole and my feet …, oh my poor feet how they ached. I can’t imagine the endurance it takes to be a cook. Hooray for the dining facilities and all the cooks in all the services. I hope they have a restful day-after-Thanksgiving. All photos are released from the DoD photo archive.